this week’s US oil data from the US Energy Information Administration, covering the week ending April 6th, showed that due to a big jump in our oil imports and a big drop in our oil exports, we were able to add to our crude oil supplies for the seventh time in the past eleven weeks…our imports of crude oil rose by an average of 752,000 barrels per day to an average of 8,650,000 barrels per day during the week, after falling by 250,000 barrels per day the prior week, while our exports of crude oil fell from last week’s record by an average of 970,000 barrels per day to an average of 1,205,000 barrels per day, which meant that our effective trade in oil over the week worked out to a net import average of 7,445,000 barrels of per day during the week, 1,722,000 barrels per day more than our net imports during the prior week…at the same time, field production of crude oil from US wells rose by 65,000 barrels per day to a record high of 10,525,000 barrels per day, which means that our daily supply of oil from our net imports and from wells totaled an average of 17,970,000 barrels per day during the reporting week.. 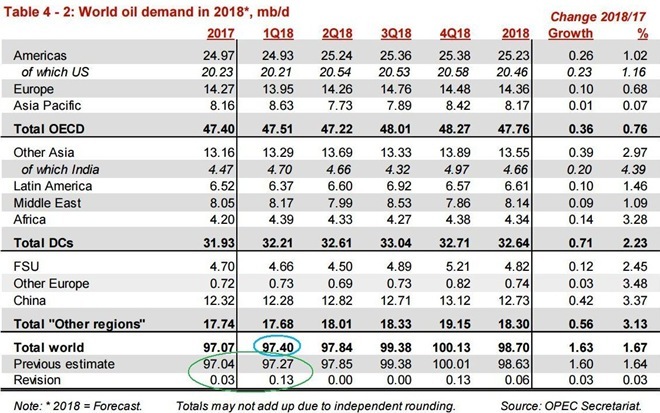 US oil refineries were operating at 93.5% of their capacity in using those 17,019,000 barrels of crude per day, up from 93.0% of capacity the prior week, and the highest utilization rate since the first week of this year….the 17,019,000 barrels of oil that were refined this week was a seasonal record, the most oil that US refineries have ever processed this early in any April, beating the record during the week ending April 7th last year…and while this week’s level of refining was still 3.3% less than the off-season record 17,608,000 barrels per day that were being refined during the last week of December 2017, it was 1.9% more than the 16,697,000 barrels of crude per day that were being processed during that week a year ago, when refineries were operating at 91.0% of capacity…. 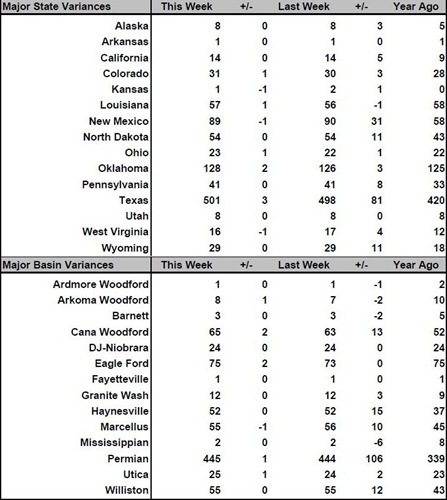 with the increase in the amount of oil being refined, gasoline output from our refineries was higher than the prior week, increasing by 35,000 barrels per day to 10,150,000 barrels per day during the week ending April 6th, after our gasoline output had decreased by 190,000 barrels per day during the week ending March 30th....with that increase, our gasoline production was 2.2% greater during the week than the 9,927,000 barrels of gasoline that were being produced daily during the week ending April 7th of last year….at the same time, our refineries’ production of distillate fuels (diesel fuel and heat oil) rose by 240,000 barrels per day to 5,256,000 barrels per day, after rising by 513,000 barrels per day during the prior two weeks….hence, that increase meant the week’s distillates production was 3.9% higher than the 5,060,000 barrels of distillates per day than were being produced during the week ending April 7th, 2017…. 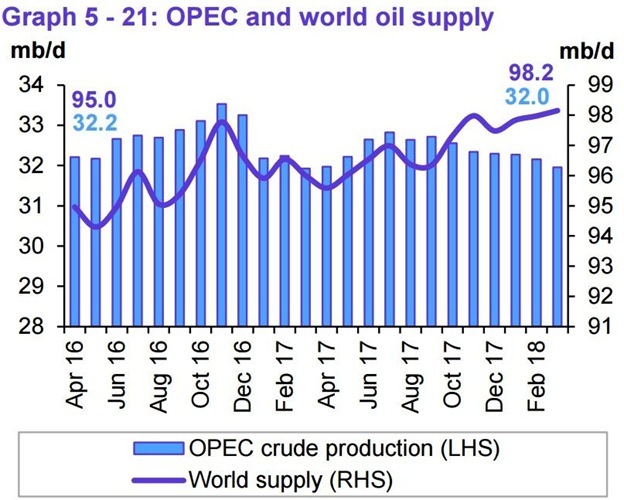 the increase in global oil output that we can see in the above purple graph meant there was a surplus in the amount of oil being produced globally, as this next table from the OPEC report will show us..
the number of rigs drilling for oil increased by 7 rigs to 815 rigs this week, which was also 132 more oil rigs than were running a year ago, while it was still well below the recent high of 1609 rigs that were drilling for oil on October 10, 2014…at the same time, the number of drilling rigs targeting natural gas formations fell by 2 rigs to 192 rigs this week, which was still 30 more gas rigs than the 162 natural gas rigs that were drilling a year ago, but way down from the recent high of 1,606 natural gas rigs that were deployed on August 29th, 2008…in addition, there is also a rig drilling currently that was listed as “miscellaneous”, unchanged from last week, but down from the 2 “miscellaneous” rigs that were operating a year ago.